The Recovering Spender - A Story on Finances, Addiction, and Freedom! #TheRecoveringSpender | Happy Deal - Happy Day! Did you by chance catch my last Facebook Live episode? I spend a chunk of time talking about this new book: The Recovering Spender by Lauren Greutman. 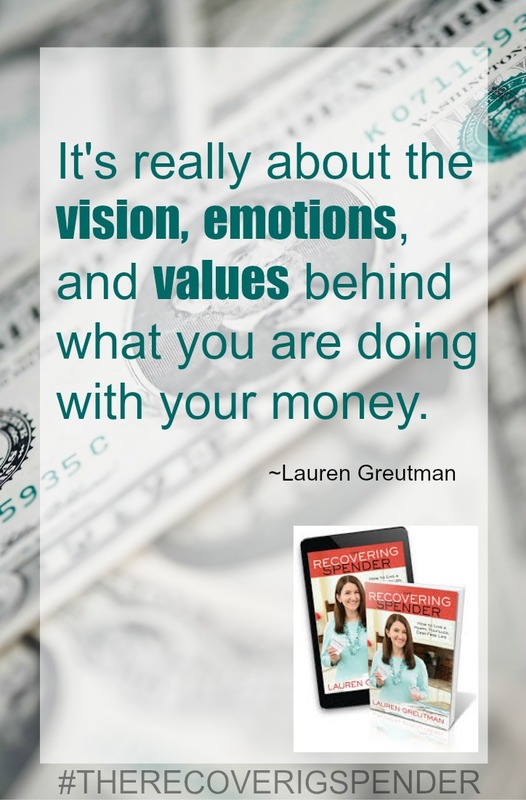 I am on a team of bloggers that is helping Lauren Greutman launch this book. If officially hits the shelves one week from today, September 13th, 2016. Good news – you can pre-order your copy today! Now why would you want to read this, let alone pre-order it? Well let me tell you about my experience reading this book. I recently brought my copy along with me while on vacation so that this could be my “down time on the beach reading material”. I’ll be honest though – I wasn’t super duper excited reading another book about finances. If you know me, I’m a huge proponent of budgeting, using coupons, and finding good deals, but I didn’t want to read a tutorial on something that I feel I have already mastered. But this book wasn’t just about those practical things. It was SO MUCH more! I met Lauren for the first time a few years ago and a blogging conference. We were actually roommates – and discovered that we have a mutual friend that lives near me (it’s a small world!) I remember looking up to Lauren thinking she has it all together with her successful blogging business, and is just so friendly and outgoing. She is so knowledgeable, caring and real. I wanted to learn as much as I could from her that weekend because she seemed to have it all together. And then I read her book and realized I didn’t know her story at. all. 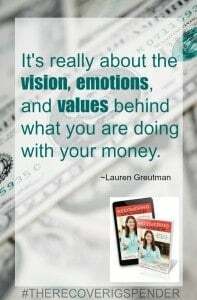 This book Lauren gets down to the nitty gritty, painful details of her spending addiction that resulted in her family being $40,000 in consumer debt! A large chunk of that was from “buying customers” to earn a “free” car from another business she had in the past. My jaw just dropped when I read how she’d go to Target, buy whatever she wanted, and hide it in the trunk of her car so her husband would see it until she put everything away. She revealed how terrible communication was about finances in her marriage. She shared her insecurities and how they drove her to “live the American dream” to have nice things, no matter the consequences. This is the exact opposite of what I expected from an awesome frugal blogger! But this is the story that brought her to her knees as she faced her addiction and recovered to be who she is today. Her story has shaped and molded her to being a financial coach and help others get out of the same rut. If you are a “spender” and can’t pass up a good deal, and the word budget makes you sick to your stomach – then this book is for you. If you are a “saver” like me, and want to get inside of the mind of those who struggle and give you insight on why they choose to overspend, then this book is for you. Her story is one that will stick with you. And her tips on how she “stays in the fence” now are just so useful and practical. You all should just get a copy and read it – for real! When you click that, it will take you to a Google form where you fill out where you purchased your book and your order #. When they have that info, then they will email all of the awesome freebies to your inbox! I’d love for you to come back and share with me what you think of the book! ← GearBest: Fresh Style Flower Shaped Ladies Statement Necklace ﻿Just $2.80 Shipped!